ALOR STAR (July 6): The fourth batch of 24 remains, believed to be Rohingyas, which were found at the detention camps in Bukit Burma, Wang Kelian in Perlis last month were laid to rest at Kampung Tualang cemetery here early this morning. The second phase of the funeral handled by Kedah Islamic Religious Department, police and Kedah Chapter of Rohingya Society Malaysia members began at 12.15am. 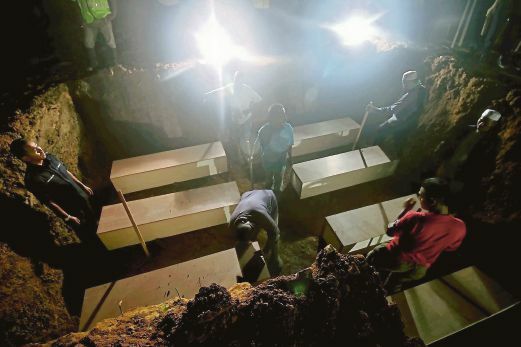 The department's director Datuk Mat Noh Dahaya said all the remains were buried in a grave upon completing the post-mortem at Sultanah Bahiyah Hospital (HSB). "As to date, a total of 99 remains had been laid to rest here while another seven are currently being examined at the hospital. "The forensic team is in the process of identifying gender of the victims," he said in a press conference today. The first burial took place at the same cemetery where 21 remains -19 males and two females- were buried in a same grave on June 22. The second phase of burial involving 30 remains comprising 27 men, two women and one unknown gender, were buried in two graves upon on June 29. Meanwhile, the third phase involved 24 remains comprising 23 men and one unknown gender on Saturday. On May 24, it was reported that a total of 139 graves and 28 transit camps abandoned by human trafficking syndicate were discovered in Wang Kelian, near the Malaysia-Thailand border.